The Heart of Oregon Corps YouthBuild program is planning to break ground on a new home this spring and is currently recruiting youth to join the effort and work on other projects going forward. The project, which will be located on Laurel Lane just south of Crook County Middle School, became available when Habitat for Humanity discontinued its Prineville branch in June 2016. "At the time, they owned this one remaining lot in Prineville," said Laura Handy, executive director of Heart of Oregon Corps. "We had actually partnered with them on a couple Prineville Crook County Chapter builds before, not doing the entire build, but helping out with certain phases of construction." So when the chapter folded, Habitat decided to donate the lot to the YouthBuild program with the expectation that they would eventually develop it into affordable housing. The unique circumstances resulted in a unique home build scenario for the organization. Building homes is nothing new for the YouthBuild program. "We are a licensed construction contractor and have been since 2009," Handy said. "We typically either partner with Habitat (for Humanity) where essentially we are volunteering with them to build the house and they are acting as the general contractor, or we have done many houses with Housing Works where we act as general contractor and are contracted to build the house." However, the new project will thrust the YouthBuild program into the role of developer for the first time, and the participants and leaders will take the lead on selecting the recipient of the home. Handy said the new process not only opens up some great leadership development opportunities for the youth, but generates money that goes back into the program. The new Prineville project comes on the heels of a $1.1 million grant awarded to the YouthBuild program. 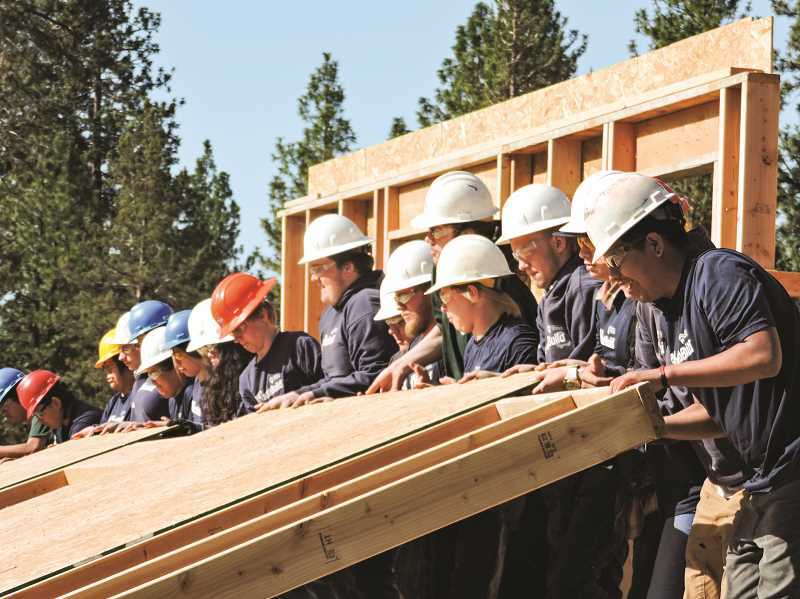 The YouthBuild grant, Heart of Oregon's fifth since 2009, will support the program during the next three years during which time the program will serve 73 youth, ages 16 to 24, primarily from the communities of Sisters, Madras, Warm Springs, Prineville, Redmond and Culver. Serving the program is a nine-member staff team of teachers, construction trainers and counselors to comprehensively support the youth who face a number of challenges such as poverty, childhood trauma, housing insecurity, foster care, disability-related challenges, or teen parenthood. A network of schools, agencies, nonprofits and family members refer youth who have to apply and prove eligibility, interview and compete for a spot in the program. Two cohorts, one of which was just formed, will work on the Prineville home. "Our first group of youth start in February," Handy said. "We will be enrolling a second cohort who will apply and do interviews in March. That cohort will start in April. If there are more interested youth and families, I would encourage them to not delay." Youth earn a small living stipend and regional bus pass while attending the program for 12 full months. Two days a week they build affordable housing and earn a national NCCER construction certification, two days a week they attend academic courses designed to re-engage and accelerate their skills for GED and high school diploma completion, and one day a week the whole program comes together for "Leadership Wednesdays," a time to bond as a program community while completing service projects in their larger community. Then, program graduates create a transition engagement contract to set goals and access YouthBuild wrap-around supportive services for another 12 months as they transition into employment, post-secondary training or degrees, national or military service. As is the case with other home build projects, YouthBuild participants will be involved with nearly all major phases of the construction process. Handy acknowledges that Oregon law requires the hire of subcontractors such as electricians, but "even when they are not involved directly, we have the sub interface with the young people and share about their careers and teach them some things." The Prineville project will likely break ground in late March or early April, with a wall-raising ceremony planned during the summer. The home should be completed by the following February.